The corporate synergy—er, inspiration—at Universal Pictures has resulted in a shared monster universe akin to the Marvel Cinematic one that’s been going gangbusters for years. It’s a great model to follow, even if we wonder whether there’s really enough room in the shadows for Frankenstein, his monster, Dracula, the Mummy, and the Wolf Man. When Universal previously attempted crossovers, it was always with silver-screen sleuths William “Bud” Abbott and Lou Costello, who regularly confronted monsters in between vaudeville acts. 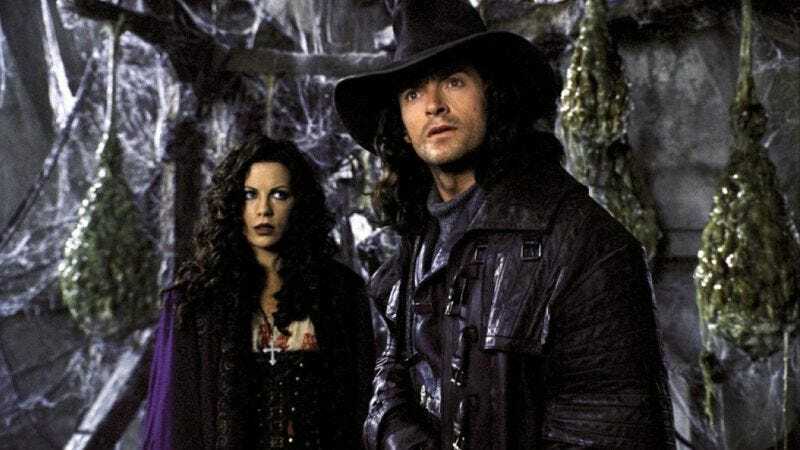 You might even say that 2004’s Van Helsing, which placed Hugh Jackman in Dracula’s sights, was a continuation of this humans-versus-monsters dynamic that Abbott and Costello engendered, which is why Van Helsing has been dubbed part of the new shared universe. That’s according to CinemaBlend’s interview with Eric Heisserer, who’s apparently writing a new Van Helsing movie. Heisserer, who also penned The Arrival, says the script is a work in progress, but will eventually tie into the gloomy environs of vampires, reanimated corpses, and the like. A monster hunter like Van Helsing should provide a counterpoint to all the evil and Tom Cruise-ness of the other films, so it’s not a bad idea. And if he gets a sidekick or partner, he can even go through the whole “Who’s On First?” routine.